4.57 points at 14 votes (rank 802). Rescue the ice load of a space freighter! Beware the planet Thiera from dying of thirst! The complicated security robots must not be understimated! After the great interplanetary war, drinkable water has become rare. The population of Thiera will die of thirst shortly. The since long overdue arrival of the ice freighter "Baccaroo" is yearningly awaited. When contact is made with the gigantic spaceship, the crew does not answer. What might have happened? Was the ship hijacked by pirates and was the crew eliminated? Unfortunately, this suspicion is confirmed by a surveillance probe: Ice pirates were on the ship and they have triggered the automatic security mechanism. This protection consists of 251 ice caring robots that are moving on the 35 decks of the freighter carrying their cold load. Each of these numbered robots carries an ice block inside it and explodes at unwarranted contact. 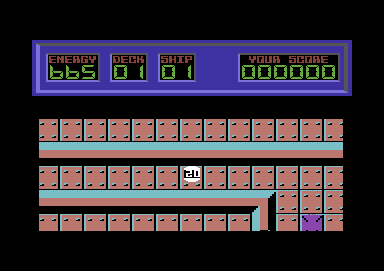 To recover the load a defusing manipulator is sent on its way and automatically docks at the space freighter. Due to safety reasons, the manipulator has to be remote controlled from this point onwards. You, as the best technician in the space fleet, take over this task! Steer the manipulator over the 35 floors of the freighter and touch the androids with a smaller or equal code value. The numbers on the robots heads are two-digit and in hexidecimal notation. The robot number is added to the corresponding value of the remote controlled vehicle. When the value has reached "FF", you have five minutes left to touch the android with the same value. Only this way you have deactivated the protective mechanism of the robot and saved the load. To reach the decks you use the same lift from which you start. It is moved by pushing the joystick (port 2) forwards (up) or downwards (down). Your vehicle has a built-in protective mechanism against androids with a higher value, which deactivates the explosion mechanism when pressing the fire button. However, the activation of this device requires 300 energy units. Also moving on the decks uses energy (approx. 1 energy unit/second). There are energy stations at every outer corner of a deck and by pressing longer on the fire button when on them you get 999 energy units again. 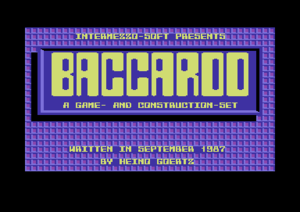 Baccaroo is mainly based on the game classic Paradroid and has an own integrated level construction kit. 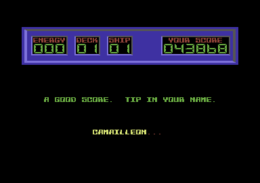 The scrolling into all eight directions is smoothly programmed, but the graphics do not have many details. The single decks are all built up the same and only differ by their colour. "MAKE A GAME" (create a game area). By right-left-movements of the joysticks (port#2) you choose between these two possibilites. A press on the fire button starts the chosen option. It starts with asking you for the desired ship. On the enclosed disk freighter "01" and "02" are saved. So when you are first playing this through, give only one of those two numbers (joystick right or left). The ships "03" to "99" cen be constructed in the editor (s.a. "MAKE A GAME"). You can create an own game area in the editor. The cursor keys move the game area below the white flashing cursor into the corresponding direction. With F1 and F3 one of the characters or obstacles at the upper rim of the screen can be chosen. The key RETURN takes over this module to below the cursor. The lift and the stations for loading up energy are always at the same place in the game area and cannot be changed. When confirming the "END symbol" you leave the editor (with security query). Now at the latest you should put in a diskette which has at least 97 blocks of free space. 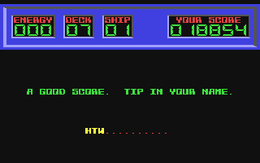 When being asked for the number of the ship, raise it by pushing the joystick to the right. Pushing it to the left lowers the value. The lift is always in the middle of the decks. The four stations for charging the energy are always at the outer corners of the decks. Each energy charging station can only be used once. H.T.W: "The game would have done with a bit of finishing. There would be e.g. the fact that all the decks of a freighter are the same and also lift and charging station are at the same places. Also special mechanisms as switches, doors, energy barriers that can be switched off, transmitters, etc. would raise the fun in the game. 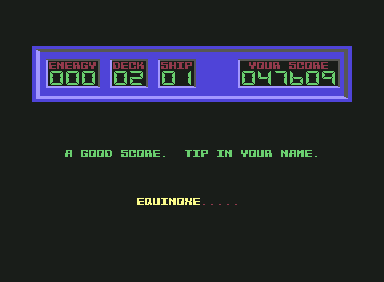 Also a small intermediate game (as in Paradroid) when taking over an android would not have been bad. As it is, the game is only a mediocre one amongst many others." Equinoxe: "Paradroid for the poor. Sorry, but no way. You hover around searching for robots that can be taken over, through the endless and always equally looking aisles of the 35 space ship decks and need to take care that you do not fall asleep during that. If you meet a smaller robot it will be automatically taken over, if you meet a bigger one, the game is instantly over. What adds to it, is the fact that in vertical aisles you almost have no chance to avoid a collision with the mentioned consequences, due to the small visible section. Tired 3 points." First release in the Happy Computer 1988/04. Second release in the 64'er Sonderheft 61. 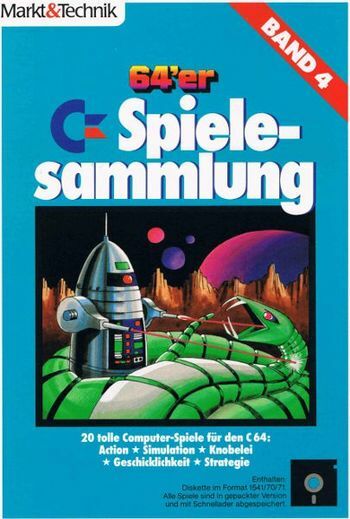 Also included in the 64'er Spielesammlung - Band 4. This page was last modified on 1 October 2017, at 13:03.